Sixers Prospect Preview: Is Shai Gilgeous-Alexander's shot trustworthy enough to draft at No. 10? Kentucky Wildcats guard Shai Gilgeous-Alexander goes up for a shot against Buffalo Bulls forward Nick Perkins in the game during the second round of the 2018 NCAA Tournament at Taco Bell Arena. In advance of this June's 2018 NBA Draft, the Sixers have a lot of preparation to do in order to narrow down the field of candidates who will be available at the No. 10 pick. They haven't asked for our help, but I will provide it for the fans in the form of scouting reports on a mix of players who (realistically) could be available when the Sixers are on the clock at No. 10. Prospect Preview: Does Mikal Bridges do enough to justify top-10 selection? Did Embiid get snubbed for First-Team All Defense? Not every one of these players we will profile at PhillyVoice is someone I would advocate drafting, and in fact, a large part of this exercise will be forming and explaining my personal view on players who exist on either end of the plausibility spectrum. You will (hopefully!) read about guys like Mikal Bridges, viewed as a near-consensus target, and wild-card picks like Zhaire Smith, raw but talented young men who might represent a bigger home-run swing. By the end of this process, my hope is that you feel a little bit stronger about whatever beliefs you have about these guys, or that I have challenged what you thought you knew about the various players on the board. Up next on the hit list: Kentucky's Shai Gilgeous-Alexander, a crafty, less-heralded guard who has pushed himself into the lottery conversation. Arriving in Lexington as just a four-star recruit, Gilgeous-Alexander was not initially expected to join the long list of Kentucky's one-and-done players after his freshman season. But with a tremendous push down the stretch in conference play, the 19-year-old guard has become a hot name in the scouting community. As a raw athlete, Gilgeous-Alexander doesn't exactly leap off the page. The elite first-step you'd want from a lead guard isn't really there. But SGA makes up for it in spades with a diverse package of finishing and dribble moves, keeping defenders out of sorts with goofy-foot finishes, excellent body control, and a mastery of the tools he does have at his disposal. At his best, Gilgeous-Alexander just glides through opposing defenses. He has a lightness on his feet that negates some of the strength and top-end speed concerns that come attached to his name, and his fluidity around the basket allows him to finish with either hand at a moment's notice. The main draw of SGA in a Sixers uniform, however, would be acquiring another dose of playmaking and off-the-dribble game the Sixers desperately need right now. On Gilgeous-Alexander's passes out of the pick-and-roll, Kentucky averaged 1.045 points per possession this season, a number that's only slightly behind the likes of Oklahoma's Trae Young, the NCAA's assists leader and another top-10 candidate this June. It's also a good bit better than Alabama's Collin Sexton fared (.848 points per possession), though some of that can be attributed to the relative talent on both teams. Philadelphia desperately needed a guard who could run more pick-and-roll this past season, which Markelle Fultz's absence highlighted. Getting Joel Embiid easier opportunities on offense should be a massive priority for the front office, and SGA would be a good fit in that department. His passing, both in terms of his ability and his willingness to move the ball, is a plus in several phases of the game. Surrounded by athletes who could run the floor at Kentucky, Gilgeous-Alexander struck an excellent balance of handling the ball himself in transition and using quick passes up the court to spring his guys for layups. While not the same level of passer and a much different prospect overall, his willingness to make the quick pass up the court is slightly reminiscent of Lonzo Ball coming out of UCLA. His eyes are always up, even if the guys on the finishing end of things didn't always come through. Brett Brown's decision to put another ballhandler on the floor in T.J. McConnell was a difference-maker in their series against the Boston Celtics, and the playoffs routinely show that you can always use more guys with the ability to put it on the floor and hurt opposing defenses. Switch-hunting is never going to go out of style, and with more players who can attack and create with their handle, the Sixers would be a more dangerous offensive team. But can his shot be trusted? The one major drawback for Gilgeous-Alexander isn't that he can't shoot — his percentages across the board are nice looking — but the sample is nowhere near large enough to trust. His 40.4 percent from three mark came on just 57 attempts all season, and there are legitimate concerns he will not be able to translate that success to NBA range and volume. Gilgeous-Alexander didn't exactly pound the ball into the ground at Kentucky, but he will certainly have been afforded a little more rope to run the offense in college than he would in Philadelphia. To say nothing of Fultz — whose existence in purgatory makes Gilgeous-Alexander a candidate to begin with — the Sixers are going to put the ball in the hands of Embiid and Ben Simmons a whole heck of a lot. That means the guys around them better be impactful as catch-and-shoot players, and we don't yet have evidence SGA can do that. Stop me if you've heard this before: Gilgeous-Alexander's problem is partially that he's not all that willing to shoot. Mechanically he's a bit slow on his jumper, and that's going to become a bigger problem for him against NBA-caliber defenses, even with length that will allow him to shoot over a lot of defenders. An optimist would point to his free-throw numbers on good volume (81.7 percent on almost five attempts per game) and point to the trend of good free-throw shooters having a better chance to improve as jump shooters. That case is harder to make when the player is hesitant to shoot in the first place. As Wayne Gretzky Michael Scott once said, you miss 100 percent of the shots you don't take. For obvious reasons, this is a major point of concern for the Sixers especially. They need someone who can thrive as a handler freeing Simmons & Embiid for open looks while also feeling comfortable in an off-ball role. They drafted Fultz with the idea he could be that guy, but so far we have seen nothing of the sort. And at least in Fultz's case, there was substantial evidence to suggest he was going to be able to fill that responsibility at the NBA level. Would the Sixers really take a player in the top-10 whose shot they're not convinced will translate, given the core pieces already in place? I'm dubious of that. If you can convince him to take more shots at the next level, he has shown the ability to get the job done coming around screens and firing off-the-catch. Ultimately, though, there's a lot of projecting here, moreso than you'd have to do with either of Mikal or Miles Bridges, as two examples. Calling Gilgeous-Alexander a good defender is misleading in the way it is for most young players. You're looking more for flashes, commitment, and box-score impact of some kind, and Gilgeous-Alexander hit all three during his year at Kentucky. The lack of elite athleticism would be a bigger problem were it not for his length and activity away from the play. He averaged 1.6 steals per game at Kentucky, and is capable of being disruptive there. Some of his best work came late in the season as he came along on the offensive end, too, and continued improvement on both ends is always encouraging from a young player. What I think is most encouraging watching him defend is that he's able to generate turnovers without necessarily doing a lot of gambling. Risk-heavy players (I would count both Robert Covington and Ben Simmons in this group) can often get their hands on a lot of balls, but can have their gambling ways exploited on back cuts. SGA, for the most part, walks a nice balance between staying close enough to poke balls loose and far enough back to cut off both options. ... are we sure he's ever going to bulk up enough to really do so? 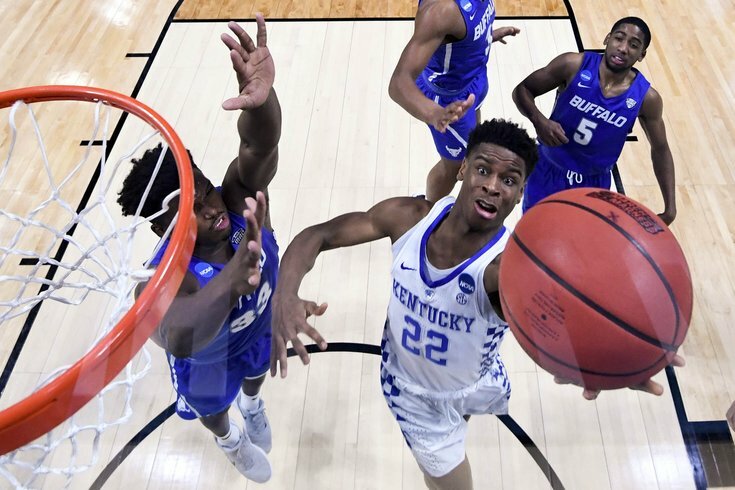 Gilgeous-Alexander has a thin, wiry frame, and while he's going to certainly add some core strength and bulk over time, it may not be enough to get him where he needs to go. There are very few players in the SEC (and really, all of college basketball) who were able to test the limits presented by his tools. Outside of Sexton at Alabama, there were not really any lead guards who could take advantage of his speed disadvantage, and the wings who are big enough to bully him on the block are unrefined developmentally. Neither one of those things will hold as soon as he's on an NBA court. Against the quicker guards in the league, Gilgeous-Alexander may struggle to contain in one-on-one situations. And even if he manages to put up a good fight against guys at the two and three positions, the strength mismatch can go south in a variety of ways. Will he end up having to foul too much to keep pace, or can he find a way to translate his basketball IQ into stops? If I had to venture a guess, I would speculate he will be a good but unexceptional defender. Frankly, the Sixers would probably take that provided he brings enough offensive value to the table. Does he make sense for the Sixers at No. 10? This question ultimately hinges on a couple important factors — how much do you believe in Markelle Fultz, and how much do you believe in Gilgeous-Alexander's jumper? If the Sixers do not get what they thought they had out of Fultz moving into the future, they run a real risk of not having enough shot creation to get to the promised land. They need outs for when teams load up to negate Simmons' impact, and they can't necessarily rely on drawing a top-end star to Philadelphia to solve all their problems. Gilgeous-Alexander would give them an off-speed pitch on offense when the fastball isn't working. It's just as big a risk, however, to continue bringing in potential non-shooters to help run your offense. The Sixers absolutely have a need for players who can put it on the floor and create, but that can't come at the complete expense of shooting the basketball. It would be a very tough call to look at a player who was hesitant to shoot in college and believe he could remain a knockdown shooter at high volume at the pro level. As the observer from the stands, it's a lot easier for me to say I believe in Gilgeous-Alexander's basketball intelligence enough that I would probably roll the dice on him. My job isn't on the line, and I can envision a future where the Sixers have high-level thinkers at several spots on the floor simultaneously, between Dario Saric, Simmons, and SGA. If you're going to play a ball-sharing, pass-heavy offense, why not lean into that identity even more? Still, I understand the drawbacks and would ultimately understand if the Sixers went for more of a true wing in June. They need outright scorers as much as they need creators, and if Fultz finds his way, you may be drafting a player in the top-10 who would ultimately top out as a bench player on this roster. How much upside is there in that role, and how much more valuable is a potential starting wing on this team? Those are questions Bryan Colangelo's group has about a month left to answer. Should the Sixers take Shai Gilgeous-Alexander at No. 10 overall?